Uncle Sam is a personification of the United States of America. He is an old man with a white beard and a star-studded top hat, who points at the viewer with one hand. Uncle Sam was first invented during the War of 1812, when the symbols of America were still the goddess Columbia and Yankee Doodle (the hero of a minstrel song). Uncle Sam quickly took over their roles in popular culture, and they are rarely heard from today. The name "Uncle Sam" may have been based on the initials of "United States", or possibly on a butcher from Troy, NY, named Samuel Wilson. There is also a British version of Uncle Sam, called "John Bull". 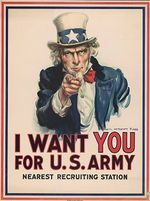 Uncle Sam's image was modeled by Walter Botts for the well known Army recruiting poster from WWI. This page was last modified on 20 April 2018, at 18:44.